Our project management team within Corporate Solutions, provides you with a single point of responsibility for all your facility projects - providing end-to-end support for the development, construction and renovation of facilities. Our project management consulting services are tailored to meet the needs of each client, both on a project-by-project and portfolio basis. In addition, our discrete project services offer you support as you seek to define your facility needs and options. These services include helping you reach your sustainability goals, training, constructability reviews, value engineering reviews and construction oversight. Designing and implementing projects in today's environment or even managing change in today's business environment is more complex than ever before. With multiple vendors, as well as a diverse range of partnerships and alliances, today's project landscape is as complex as it has ever been. Trying to manage multiple projects for the same program initiative adds more complexity to the management team. Unresolved issues can delay projects for weeks and months, which can turn into lost revenue, a lost competitive edge and advantage, and an unhappy client. A dedicated PMO provides the oversight to deliver your projects on time and on budget by managing your schedule, scope, and resources while watching the cost and quality across the whole portfolio. The PMO provides expertise tailored to your business requirements while taking responsibility for all projects included in your portfolio or program and provides the extra focus and resources complex projects demand, this is done by adapting and adopting already existing policies and procedures to project management specification in order to meet the business and strategic need of the organization. MCS team has helped small, medium and global organizations to plan, manage and deliver projects, programs and set up project and program management offices using best practice standards based on the worldwide standards: Project Management Institute's (PMI) PMBOK and Prince2. Primavera is about the most contemporary project management control tool used in the oil and gas industry. Its function embraces Planning, scheduling and resource (cost and human) control. PertMaster is Schedule Risk and Risk analysis software. The software embraces both the qualitative and quantitative risk analysis techniques, using the Monte Carlo simulation method. This software enables the project manager, risk manager/engineer and the entire project team to identify and prioritize risk throughout the project life cycle. 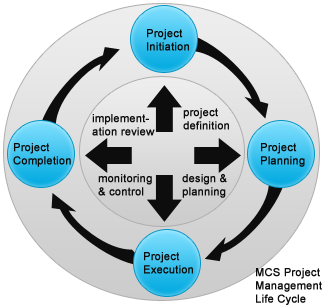 Ms Project is the most common project planning and scheduling software. It is readily available, user-friendly, and applicable to all projects. Though it has its limitations when compared to Primavera, its relevance and use is still prevalent. While WBS Pro-chart, is useful in creating a comprehensive work break-down structure (WBS) for projects. This facilitates planning, resource/task costing and man-hour distribution. Crystalball 2000 is an easy-to-use suite of forecasting, risk analysis, and time-series forecasting software. The most complete business intelligence package of its type. CB 2000 Professional enhances the way you build, interpret, and apply your spreadsheet business and management models. Crystal Ball 2000 Professional includes: Crystal Ball 2000 Standard - Monte Carlo simulation software for Excel spreadsheet risk analysis and forecasting. The PMP certification is the most popular and widely acceptable certification for experienced Project Managers and Project Management practitioners. The examination is organized and conducted by Project Management Institute, USA and it is conducted world-wide. Glover Court Community Mess, Ikoyi. Concept originators, initiators and planners for a 2hectares water front property for a mixed-use residential and training resort development in Alpha beach, Lekki. Members of the Project Team for the post-construction (take-off) phase of the project. MMA2 is the state of the art domestic & regional airport terminal in Lagos Nigeria. Project Managers for remodeling and expansion of existing structure to a 70-Bedroom Hotel & Suites plus adjoining duplex health & fitness spa facility. 2 No. Detached Houses at Oniru Estate, Victoria Island; Project Managers & Developers. Project Managers & Developers for 27 No. Hostel Rooms. Let us take care of the design and construction details and minimize risk on your next construction project. Please contact us for additional information regarding our Project Management Service and how this service can serve your organization's needs.